I know I tend to write more about Makeup, but recently I have been switching up my skincare routine and trying out new brands. 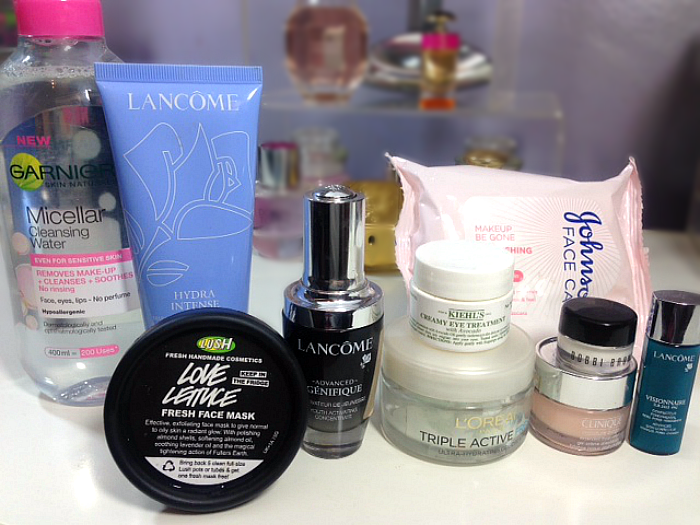 For now though I'm enjoying my current skincare regime so thought I'd share what little beauties have been gracing my face as of late! I'm going to start off with my evening routine, why? Because this is the time of day that I get to remove all the slap that has graced my face for 12 hours straight. 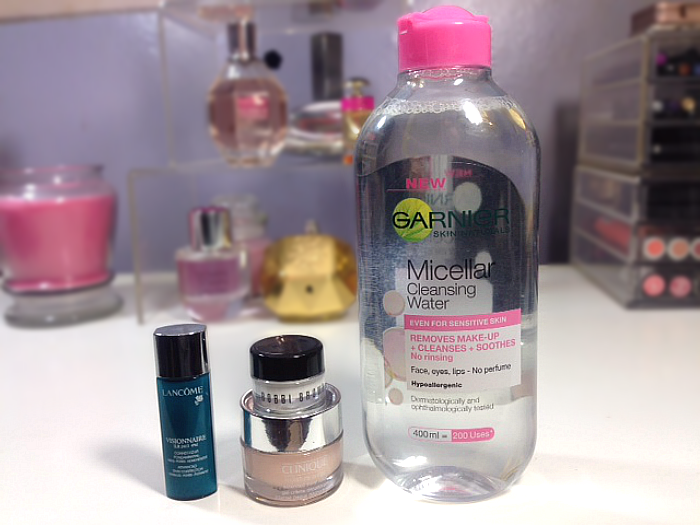 I also do more in the evening as I have the time to give my skin a little treat! Since doing a more thorough night time routine, the texture of my skin has really improved. After I have removed all my makeup I then use a serum. My current night time serum is Lancôme Visionnaire Advanced Skin Corrector I actually don't own a full sized bottle of this as I bought and reviewed the Lancôme Youth Activating Skincare Collection which came complete with a luxury sample of the serum PLUS my good friend at Lancôme gave me a lot of samples of this, that have basically lasted me over 3 months. This serum is great as it helps to even out your skin tone, whilst helping to reduce wrinkles. My skin feels gorgeous after using this and I'll be heartbroken when all my samples have run out. Next up is my night time moisturiser. I have been using a lot of different brands but currently I'm loving Clinique Moisture Surge Extended Thirst Relief for all Skin Types I have oily skin but my skin is lacking a lot of hydration, so this Moisturiser is ideal for my skin type. It's a gel formula that adds lot's of water back into my skin. My skin literally drinks this all up and loves it! After moisturising I apply my eye cream. Now I have been sampling a lot of different eye creams lately and I've been using a different one for day and night. I was given a really good sample size of Bobbi Brown Extra Eye Repair Cream and I've been loving it. It's a bit too rich for me to use during the day BUT it's amazing to use at night. As well as being hydrating, this is also meant to help reduce puffiness, dark circles and wrinkles. I've barely used anything from the sample and can see this lasting me a few months! That's my day to day night skincare routine. I also use two face masks every week. 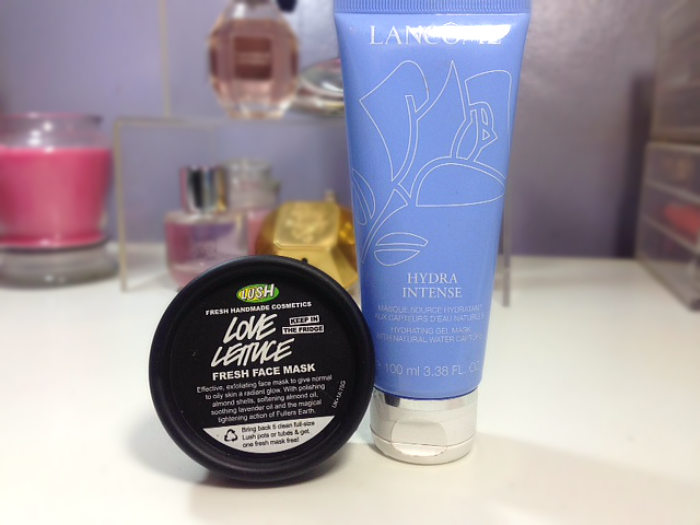 Twice a week I use Lush Love Lettuce Face Mask which featured in my May Favourites I adore this face mask. This is a great face mask for anyone who suffers with oily skin that is also dehydrated. It has active natural ingredients that help control your sebum as well as ingredients that will help keep your skin hydrated. My skin feels gorgeous after using this! I tend to use this on a Sunday and Wednesday night. 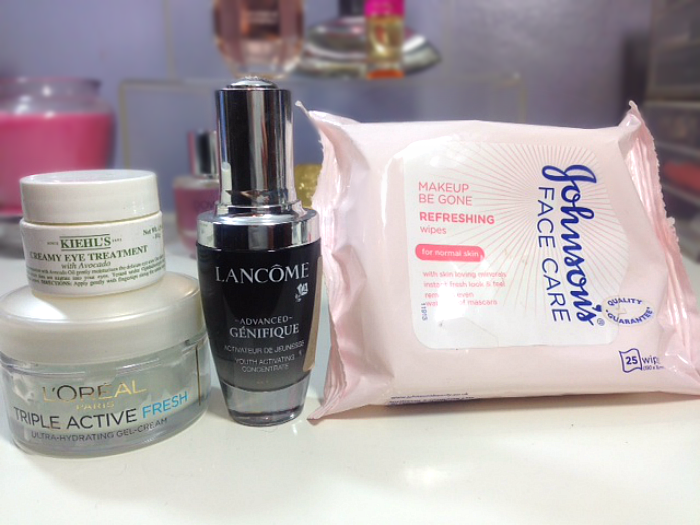 Once a week instead of using my normal night serum, moisturiser and eye cream, I instead use Lancôme Hydra Intense Gel Mask which was in my Lancôme Youth Activating Skincare Collection that I bought. Now they do say you should apply a thick layer and leave this on for 15 minutes, but what I do, once a week is apply a thin layer as my night cream and go to bed in it. This really helps hydrate my skin and I have found that for me, this works a lot better. 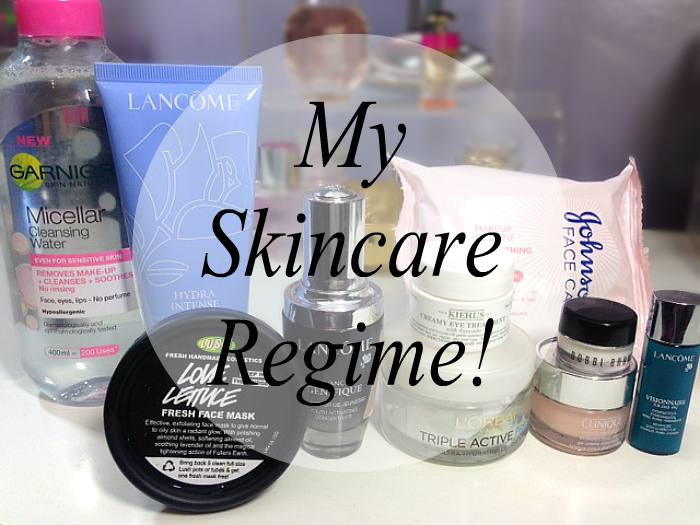 Now on to my daily skincare regime which I'm afraid isn't too exciting! When I wake up I use a flannel on my face with cold water (this is more for waking me up) I then run a Johnson's Face Care Makeup Be Gone Refreshing Wipes over my face. I know people will be like NOOOO not a face wipe! I have already removed all my makeup the night before, rinsed my face with cold water in the morning, so my face has no makeup on. I find this just refreshes my face. For my day time serum I use Lancôme Advanced Génefique first, I love this. This has lasted me around 4 months and it's still going strong! I actually reviewed this just HERE I love how my skin feels after using this, I have noticed a big change in my skin AND my makeup applies beautifully over the top of this too. For my day time cream I like to go for something light, the L'Oréal Triple Active Fresh Ultra-Hydrating Gel-Cream is what I've been using for the past few months and I love it. It's a gel formula, which my skin just loves. This has no fancy anti-ageing ingredients in it, it's simply just a hydrating gel moisturiser. Finally my day time eye cream, Khiels Creamy Eye Treatment with Avocado now I love this eye cream, hands down it's my favourite so far. I'd totally use this at night time too but for blog purposes and for wanting to try out different products I am just using this during the day. This again, like my day moisturiser, isn't ant-ageing, it is super hydrating though and leaves my eye area feeling and looking less dehydrated, which as a result doesn't make it look so tired. So that's my current skincare regime. It sounds a lot but it's really not. There is things within my lifestyle that I could do that would help improve my skins hydration and dullness BUT I'm young, I want to enjoy life, so for now I think it's important to be using some great skincare products, and not all of them cost an arm and a leg either! As soon as I've run out of my Lancôme skincare I will actually be trying out some cheaper serums to see how they compare, so there will no doubt be a comparison review a long the way. What is your must have skincare product? Do you use different products for during the day and for night time?